Dozens of new skyscrapers will populate Tokyo’s skyline, just in time for the 2020 Olympic and Paralympic Games. Of course, some of the best views of those skyscrapers are through the ancient evergreens and autumn leaves in Shinjuku Gyoen National Garden, once part of an Edo-era (1603-1867) feudal lord’s home. Before the Olympic Games crowds arrive, here’s a guide to seeing both old and new in Tokyo. While many ancient buildings were destroyed in 1923 by the Kanto earthquake, and in World War II bombings, several traditional buildings and neighborhoods still stand. Shrines and temples are among the most historic buildings in Tokyo. Tokyo’s oldest temple is Sensō-ji, a Buddhist temple, and a five-story pagoda, the Asakusa shrine (1649), featuring a traditional tile roof above red pillars and columns decorated with gold. Every May, this building hosts Sanja Matsuri, one of Tokyo’s largest Shinto festivals. Surrounding the complex is the Asakusa area, a collection of hundreds of tidy, vendor-style storefronts selling everything from handmade noodles to sweet rice desserts. Local vendors even rent traditional Japanese robes, if you feel inspired to dress in a traditional manner. To visit a working neighborhood in a similar style, stop by quaint Yanaka. Here, you’ll find noodle shops, sweet handmade desserts, artisans making and selling textiles, carvings and jewelry, from low-slung one- and two-story buildings. The area retains its small-scale appeal due to miraculously being spared from fire, earthquake and bombing damage. Visitors can step into the past at Fumiko Hayashi Memorial Hall, a museum with novelist’s artifacts amid Edo-era architectural style. In 1941, Fumiko Hayashi built her home using Edo details, right down to a walled garden for respite (and writing). Interestingly, hotels are also embracing established tones. Mimaru hotel brand will soon open a Mimaru Tokyo Ueno North, with apart-hotel rooms that resemble a traditional Japanese home, with low seating, cooking facilities and bedding. Not just shrines and temples, but churches can be eye-catchers as well – such as St. Mary’s Cathedral, completed in 1964; it’s a stainless steel, abstract construction of swooping shapes. Because part of Tokyo’s appeal, of course, is its promising modernity – almost futuristic in tone, with gleaming glass and aluminum structures that seem almost otherworldly – and found nowhere else in the world. Some of Tokyo’s most daring new buildings are along Omotesandō Avenue, the “Champs-Élysées of Tokyo,” where upscale boutiques are designed by a who’s-who of award-winning contemporary architects and firms, from Rem Koolhaas to Norihiko Dan. The stone and glass Marc Jacobs cube is topped with bright metal panels that are illuminated at night, while Comme des Garcons looks like a future-forward capsule. Flat, concave and convex green glass panes are wrapped in a net-like frame at Swiss Prada Aoyama Tokyo, a gleaming six-story Prada flagship store. At Christian Dior’s boutique, there’s a translucent, multi-story exterior, while Louis Vuitton’s is patterned on stacked suitcases, and Coach’s façade is a maze-like grid of rectangular glass. The Italian flagship store of Tod’s is embraced by concrete shadows echoing the trees that line Omotesandō; next door, the menswear shop Hugo Boss looks like a towering-yet-friendly asymmetrical castle rampart. 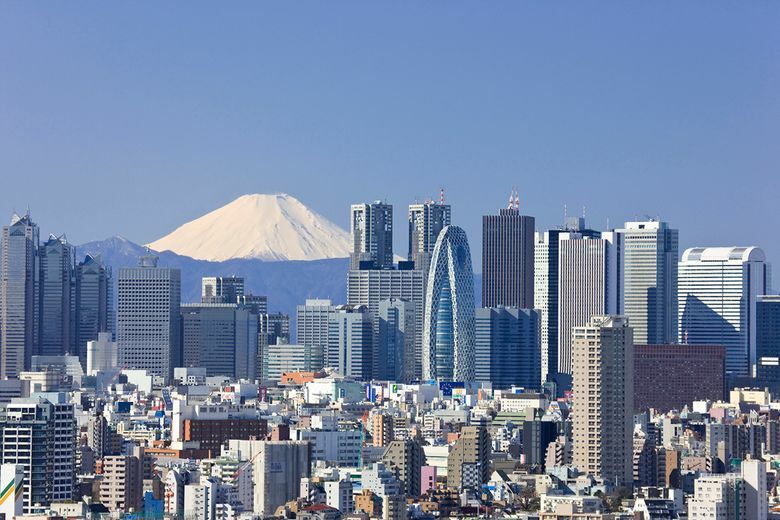 But for the tallest structure in Japan, head to Tokyo’s historic Sumida district’s 2,080-foot-tall Tokyo Skytree, the tallest freestanding broadcasting tower in the world, according to the Guinness Book of World Records. Since 2012, the building has operated panoramic observation tower, and a television/radio broadcasting tower, complete with a restaurant. The futuristic building also boasts traditional pagoda-like elements, despite being constructed of glass and steel, and lit with colorful LEDs at night. Mode Gokuen Cocoon Tower, one of the world’s largest institutional structures, is an unusual sight. The 669-foot tall, 50-story building opened in 2003, is shaped like a dark-blue glass cocoon standing upright on one end, wrapped in white, weblike aluminum. Designed by award-winning Japanese architect Kenzō Tange, the building’s interior “cocoons” up to 10,000 students per year. On a quirkier note, near Asakusa Station is the instantly recognizable Asahi Beer Hall, shaped like a frothy-topped beer glass, part of the Asahi Breweries headquarters. Completed in 1989, the Beer Hall and the nearby golden-squiggle “Asahi flame,” were designed by French designer Philippe Starck. Japan and France also meet in the Midcentury marvel Tokyo Tower, with echoes of the Eiffel Tower. The bold white and orange latticework is noticeable throughout Tokyo. Completed in 1958, this is the second-tallest structure in Japan (after Skytree), and offers panoramic views from two observation decks, along with shops, museums and eateries. Recently, designers around the world are embracing and celebrating nature, carving out green amid bustling cityscapes. This fall, one of Tokyo’s newest buildings incorporates ongoing interest in merging natural and human-made beauty. The Shibuya Stream is a 35-story building with office space (including the home of Google Japan), boutiques, and a hotel, and offers a green promenade past open-air shops and cafes, alongside the revitalized Shibuya River. Similarly, the 35-story Tokyo Midtown Hibiya opened in March 2018, and offers the rooftop Parkview Garden for respite and relaxation. Visit the Hibiya’s dozens of luxury fashion and international restaurants, a bustling foodhall, 11-screen movie theater and cafes. The live-work hub offers everything from izakaya (or Japanese-style pub food) to physician services to garden shops to tech office space. In the fashionable Minami-Aoyama area, SunnyHills Pineapple Cake Shop is a three-story lattice structure, made of cypress wood meticulously arranged into diamond shapes. It’s a fun, lighthearted building that hearkens back to traditional Japanese structures made of wood. The noted architectural firm who designed the sweet stop – Kengo Kuma Architects & Associates – are hard at work at their next masterpiece … Tokyo Olympic Stadium 2020.